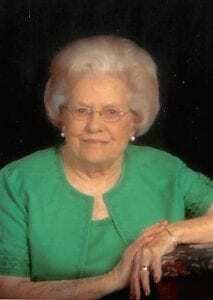 Dorothy Fetters Haverlah of Pleasanton, passed away Wednesday, March 21, 2018 at the age of 90. Dorothy was the only child of Edmund and Florence Fetter, and was born in Pleasanton on July 1, 1927. Dorothy grew up in Pleasanton and started school in Pleasanton but in the fifth grade the family moved to the Leming area and she was changed to a two-room school with two teachers. She graduated from Pleasanton High School as Valedictorian of the Class of 1945. After graduation she went to work at the First National Bank in Pleasanton. This is where she met her future husband, Clydell Haverlah when he came in to do his business. Dorothy and Clydell were married in 1946. Dorothy was an active member of her community, having served on the city council of the City of Pleasanton, a former President of the Woman’s Club of Pleasanton and an active member of the First United Methodist Church of Pleasanton. She made a career working in real estate with her husband Clydell. Dorothy introduced the children’s activities at the Methodist Church in Pleasanton. She joined the Woman’s Club in 1984 and remained an active member until her health declined, she held every office in the club and some twice. As a member of the First United Methodist Church she was very active and served on many different committees. Dorothy really enjoyed her association with the church, but as her health began to decline had to give up her many roles with the church. She represented her district on the Pleasanton City Council for many years. After their retirement, Dorothy and Clydell traveled all over the United States and Canada with the Austin’s, the Maywald’s and the Meadow’s. They all had their RV’s and all had a great time. Her pride and joy were her grandchildren and great-grandchildren. She enjoyed every minute with them, whether it was hunting, fishing, playing with the boys or making mud pies with the girls. Dorothy is survived by son, Edward Haverlah and wife Dana; daughter, Cynthia Harwell and husband Wayne; grandchildren, Page Blanton and wife Jennifer, Whitney Blanton and wife Cristina, Megan Wood and husband Trey, Brian Harwell and Brooke Whittenburg and husband Dustin and great-grandchildren, Jonah and Ruth Blanton, Nolan, Amelia and Fletcher Wood and Daniel Whittenburg. She is also survived by her nephew Duane Degenhardt and wife Sherry and niece, Ann Terry and husband Hunt. Dorothy is preceded in death by her husband of 53 years, Clydell Edward Haverlah and her parents, Edmund and Florence Fetters, her father and mother in law, Elo and Hilda Haverlah and sister in law, Alene Maywald. A visitation was held at Hurley Funeral Home on Monday, March 26 from 2 – 8 p.m., with family receiving friends from 5 – 8 p.m. A funeral service was conducted at First United Methodist Church in Pleasanton on Tuesday, March 27 at 2 p.m., followed by interment at Pleasanton City Cemetery. In lieu of flowers the family asks that donations be made to the First United Methodist Church of Pleasanton or the Pleasanton Woman’s Club. For anyone wishing to leave condolences for the family, please share memories or sign the online guestbook you may do so at hurleyfuneralhome.com.